Seven years on, most Greeks feel trapped in a maze. Seemingly, every possible exit rout has been explored, only to lead to a blank wall. Internal and external commentators translate that perplexity into a baseless desire for some external solution, for a deus ex machina whose intervention is repeatedly postponed. This short note tries to sketch the source of the perplexity and to suggest that the usual reactions of simply waiting for something to happen threaten to make matters worse. This only makes the case for a well-meaning response of swimming against the current only more pressing. Serial optimism leads to perplexity. 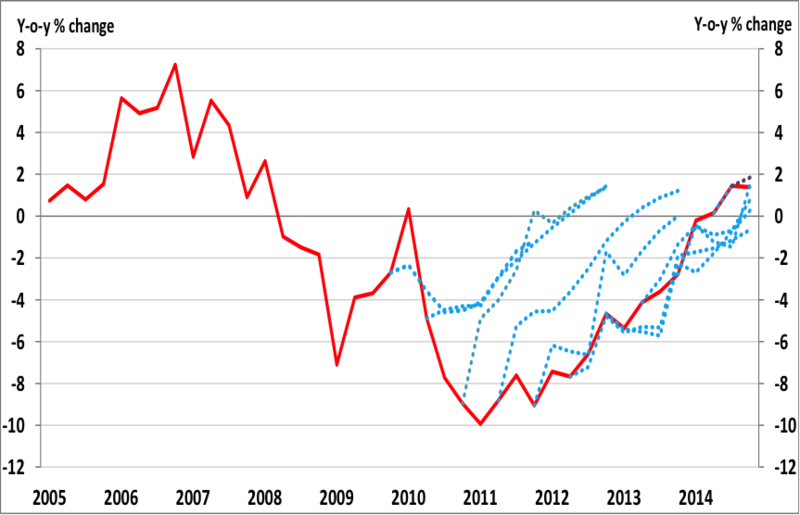 Figure 1 shows in the blue dotted lines the optimistic expectations in terms of real GDP growth of consecutive reviews of the initial two rescue programs. In red it plots the actual outcomes. 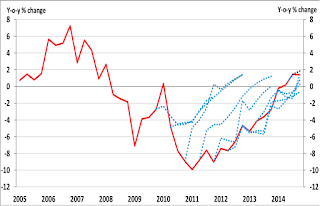 The red is consistently below the blue line, showing that each policy review (typically following a reform episode) set off with what proved to be wild optimism. This was disproved again and again, as the actual outcomes were characterized by underperformance. If we forget the specific context of the data in Figure 1 and see it as an attempt at projections using an econometric model, we could interpret the technical problems leading to consistent under-predictions as arising from two possible econometric problems: either from omitted variable bias –there is a variable which works in the background and which the equation has neglected to include. Or that our econometric equation has chosen the wrong functional form –meaning that the way the separate variables interact with each other has been misunderstood. Translated into more political terms, these two situations could mean either that accounts of the crisis are missing a key ingredient, or that mind-frames and institutions that affect how all separate variables work, have either been misunderstood or are in the process of changing but in a way which is not understood. Whatever the precise reason, the fact of the matter is that a number of initiatives were tried out with high expectations, and failed. The disproving of this type of serial optimism leads to perplexity and mystification about what the next steps can be. The next figure confirms that the reform scorecard is indeed busy. Figure 2 plots the reform responsiveness rate, an indicator compiled by the OECD, which depends on the number of reforms promulgated in the period 2011-2014. 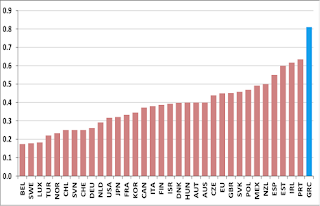 Greece stands out, even compared to other bail-out countries, and towers above other countries such as the Netherlands, Germany, not to mention Belgium and Sweden. Whatever was the case in the past, procrastination and indolence are no longer the case. The problems of implementation have indeed plagued Greek programs, as shown in Figure 3. Reform implementation has been weaker in Greece than in other EU countries. Figure 3 shows the fraction of prior actions and structural benchmarks for the IMF loans of the respective programs for all reviews corresponding to each category. However, whilst Greece has a higher percentage of targets not met, we must remember that Greece had a higher total number of reforms compared to Portugal and Ireland. Thus, though the statement that reforms have to be undertaken needs to be qualified, one should note that half empty is equivalent to half full. This economic performance provides the background for the perplexity of all those involved in commenting on the Greek economic performance. Something is seriously wrong but no one knows what. This sets the scene for varieties of political responses. How to respond? Three types of answers. This perplexity has given rise to three types of response by economic commentators, whether in power or incumbents in opposition, as well as outside bodies. First, persist with the implementation of the program. This approach sees the implementation flaws and focuses on fixing technical details and attempting to regain program ownership. This line is favoured by the Troika and will undoubtedly lead to improvements at the margin. However, the supporters of this line sound increasingly uncomfortable and are beginning to adopt positions of blame avoidance more reminiscent of Greek governments. As the spotlight shifts away from the Greek crisis, there appears an implicit tacit assumption that you can keep on trying, but not much can be expected. The second political response essentially denies that there was a problem in the first place. As memories fade of the pre-crisis world, it is easy to pin the blame on austerity: the crisis is due to austerity and not vice versa. SYRIZA was elected with this line but had to abandon it in the summer of 2015. Nevertheless, though SYRIZA is implementing the original program, they lose no opportunity to remind everyone that they disagree with it and that it is even making things worse. Their hope is to cling to power and hope that something good will happen from outside. This manna from heaven is debt relief and, hopefully, write-offs. More sophisticated versions are hoping for foreign investment, but are doing very little to attract it. The third reaction comes from the official opposition (ND). According to them, the solution of all problems is a change of political personnel. Today’s crisis is squarely blamed on SYRIZA alone, on the grounds that if it were not for the first months of 2015, the economy would have rebounded. This line of argument implicitly assumes that all was fine in 2009 and that the governments of 2004 to 2009 have no case to answer. Both government and opposition views are variants of the auto-pilot line of reasoning. They are essentially plumbing for a wait and see attitude. In other words, they are pinning their hopes on the «compressed spring idea»: the crisis has gone for so long, that sooner or later the economy will rebound. So, it’s just a matter of hanging on to power / or seizing power at the right moment and hope for the best. Recapitulating, in the face of perplexity and obvious inability to decide what is wrong, all sides of the Greek crisis are just biding for time in the hope that something will happen. They would dearly like the economy to rebound, and are positioning themselves to take the credit for this. This is only slightly better than old style blame avoidance, but nevertheless, persisting in doing nothing encourages a generalized sense of signing off. This signing off is evident in different ways for different actors. · In terms of external actors, the spotlight has already shifted to the refugee crisis, abandoning the economic crisis halfway. · In internal affairs at the micro-level, we are seeing an exodus of individuals, of financial capital and of entrepreneurship. · At the macro-level, cynicism is entrenched. Interest has already shifted to the politics of redistribution, arguing that the size of the shrinking pie that goes to electoral clients is being increased. Perplexity with the economy encourages shifting of attention to non-economic matters. Recalling AO Hirschman’s classic book «Exit, Voice and Loyalty», the perplexity of political actors in all cases shifts and as people lose heart, shifts the emphasis from seeking a voice to correct matters, to cutting one’s losses by exiting –whether individually or collectively. In this way, the inability to provide economic solutions is encouraging a political process which leads to further decline. The hoped-for external resolution becomes increasingly unlikely. How should an economist, determined in her own personal case not to exit and not to seek an individual solution, behave? The answer must be to swim against the current. Returning to the serial optimism of Figure 1, she can formulate two possible reactions. First, a technocratic reaction: try to find the missing variable. She should look back on the analysis and try to find the missing factor. Has the crisis been misdiagnosed and misrepresented? 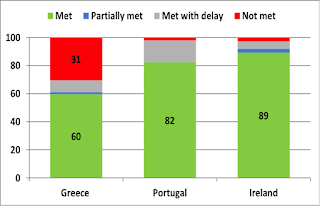 In an LSE/Hellenic Observatory blog I have argued that this crisis is above all a production crisis, pertaining to the small family firm (http://blogs.lse.ac.uk/greeceatlse/2016/09/16/the-greek-crisis-is-a-crisis-of-production-not-of-public-finance/ ). Much of what has been happening during the crisis has made the position of that most important economic actor untenable. In this way, it undermines any internal dynamic of the Greek economy to rebound. Second, a political reaction: try to fix the functional form, i.e. try to intervene on how economic instruments operate in society. In order for this to happen, old, pre-crisis mind-frames have to be revised and a pervasive lack of trust corrected. This means nothing less than a new kind of politics. Is such a politics feasible or realistic? The only feasible route is to lead by example. To reverse the tendencies of exit by an example of loyalty; to enter politics just as everyone is leaving.